It is common for car doors not to close completely on the first try. Slamstop ensures full closure of car doors at the first attempt and precludes them from opening while the car is on the move. 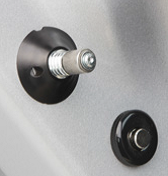 Slamstop device closes the doors automatically. from -40 to +80 С.
Slamstop soft-door close device consists of a working gear, a control unit, a support cantilever and a cable, an electric drive and a magnet with a door position sensor. Inside the car door, a catcher is installed, while on the door’s end a hole is made for the catch pin. The electric drive and the actuating mechanism of the device are rather small and will easily fit into any door wider than 5 cm. 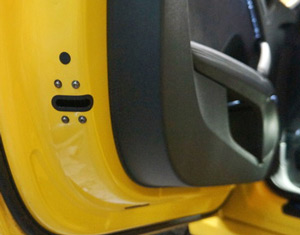 Slamstop is not connected to the car’s door lock and is fully hidden from sight. The device is not subject to mandatory certification, but we gained voluntary certification in Europe and the USA, successfully passing static and dynamic (crush test) trials.